9 AM PST of the 28th the Moon conjuncts Zeus, immediately followed with a square to Mars and a conjunction to Saturn. This presents a complex wherein the emotions and ‘I am’ challenge us to act, to do ‘it,’ but we feel a suppression of intuition that makes us very hesitant to go forward. Much here depends on where Saturn is transiting in the personal chart, as well as any aspects it makes, and what if any aspects are currently being made to natal Saturn. With Merc not just retro but still (for a day) within quincunx of Sedna, communications may be especially hard to grasp and thoughts to collect in any coherent fashion. Note what comes forward but make actions modest; anything not under consideration before the Merc retrograde should be tabled for a later vote. 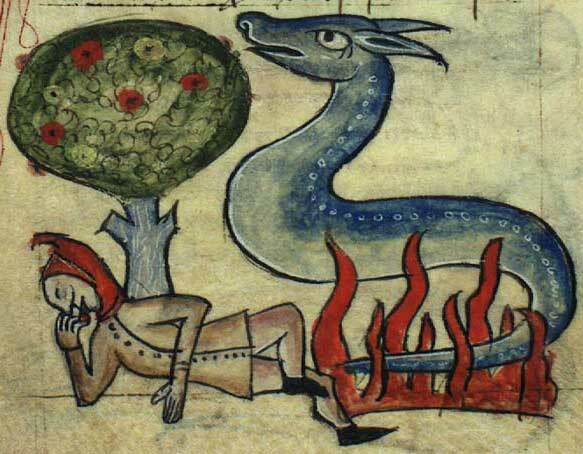 looks like the serpent won over man even the tree lacks appendages. probably not able to harness the power of words. Can you write it something, Julie? ‘Fraid not, I’m a little tongue-tied myself, at the moment 🙂 Maybe you could supply some dialogue? most sublime and superior serpent we are most appreciative of the fireworks as we are presently freezing in the dark. If your most hypnotic intellegence is looking for a vacation destination why not start at true north, it takes the guess work out of traveling south! located at 90 latitude, it’s the absolute top of the world!! Here I mean there my dear owner of 1 million scales each one more royal blue than the next is where you must go as time as it were stands still and everything else dose too. at anyrate surpent of mine everyone has a hard time with human beings but it looks like you’ve burned bridges with that one. so a ‘time out,’ at the NP (North Pole) is just the thing. There you won’t be bothered at all! the nearest land mass is Kaffeklubben Island, no people there either only a few birds in the summer.